COULD YOU HELP SOMEONE LIKE JUSTIN? Justin Pounder and his family have had many unexpected challenges over the last few years. Justin was rushed to hospital where a CT scan revealed a 32cm tear or rupture to his aorta. Justin was only 31 years old. The Pounder family has a history of heart conditions. Various members of Justin’s family including his father, a paternal aunt, two cousins, his paternal grandmother and great grandmother all had experienced some form of serious or fatal heart condition. Justin’s father had his aortic valve replaced and his enlarged ascending aorta reinforced. Justin’s young cousin died of heart failure at the age of 15. Justin survived this first attack – but he was incredibly lucky to be alive. Death can occur in as little as 11 seconds from a ruptured or torn aorta. For six years after his first hospitalisation, Justin underwent multiple surgical and endovascular aortic procedures. After many complications, several hospitalisations and incredible uncertainty, Justin was finally diagnosed with a rare condition known Loeys-Dietz Syndrome. In November 2009, Professor Paul Bannon replaced Justin’s ascending aorta and aortic valve and now in 2011 Justin is fully recovered. Loeys-Dietz Syndrome, with features similar to Marfan’s Syndrome, is a genetic disorder which affects blood vessels in the body, especially the aorta – the largest artery and the main artery from the heart to the rest of the body. Since the syndrome is rare, it is not known how often it occurs or who is more likely to inherit it. Research into Loeys-Dietz is really just starting and more work needs to be done to continue to develop techniques that improve the life-expectancy for all those diagnosed with this rare and life threatening disorder. 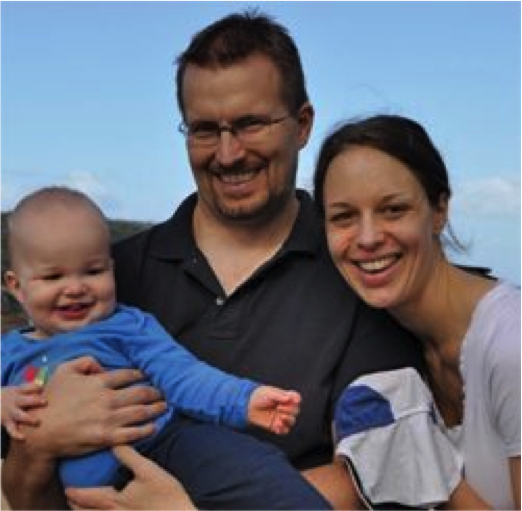 In March 2010, Justin and Meg’s son Jeremy George was born. “The words of Professor Richmond Jeremy’s grandfather to my grandmother in the 1950s came true that day… ‘In the future we will be able to fix this type of problem…’ – well I’m living proof of that… they’ve fixed me and through the wonders of IVF and DNA testing we’ve been able to test, screen and prevent passing on the dodgy gene to future generations!